After our snowy adventures in Tignes with Mark Warner, I thought I’d give you the full low down on our trip in case any is thinking of a family ski holiday next season (or even squeezing one in next week!). So, here’s all the details of Mark Warner in Tignes. You can watch what we got up to here..
A nifty 1 hour 30 minutes from Birmingham to Grenoble, this was one of the most pleasant flights we’ve ever been on. I’m guessing it may be a different story at half term, but the plane was only half full. There was even a Mark Warner rep at the airport as we checked in to answer any questions and welcome us. 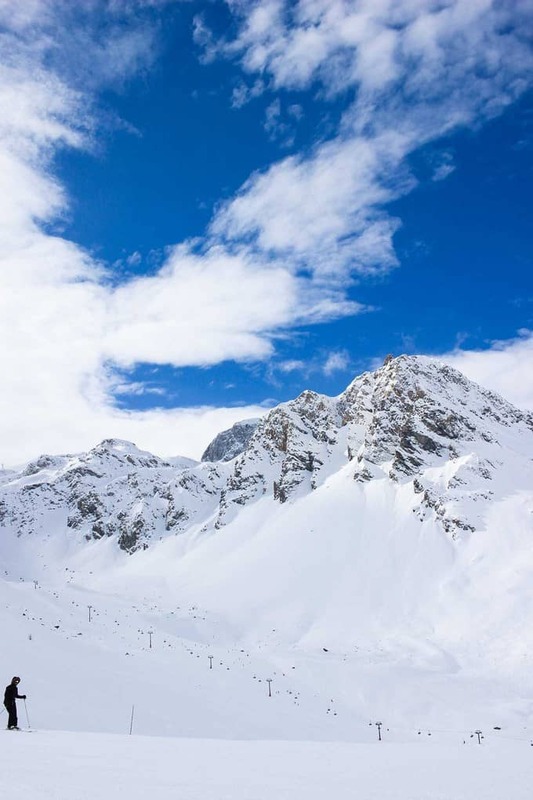 Flights to Tignes with Mark Warner are also available from London Gatwick, Heathrow and Manchester. The transfer from Grenoble airport to Tignes was about 3 hours. It sounds like a long time, but honestly it was absolutely fine for us. I’d packed lots of snacks to take and on the way there, we slept for most of it. The last 30 minutes towards Tignes are winding mountain roads and rest of the journey was straight, flat roads. The modern, clean coach had a loo on board and there was also a comfort stop halfway there on the way out. Pack plenty of snacks and possibly a travel pillow and you’ll be all set. 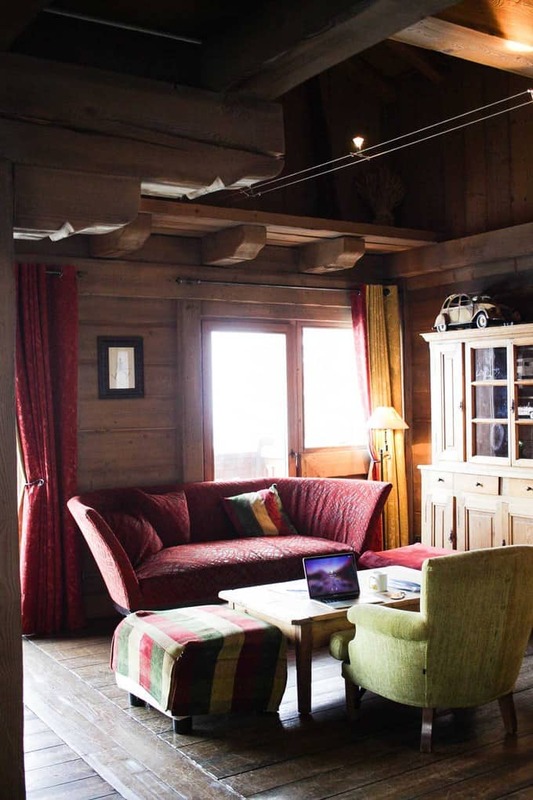 Family ski accommodation is often fairly basic, valuing location and childcare above everything else, but definitely not at the Chalet Hotel L’Ecrin. The hotel is a new addition to the Mark Warner portfolio, it has 52 bedrooms, an in house treatment spa and swimming pool. It has fantastic facilities, but somehow still manages to feel like a small family hotel. 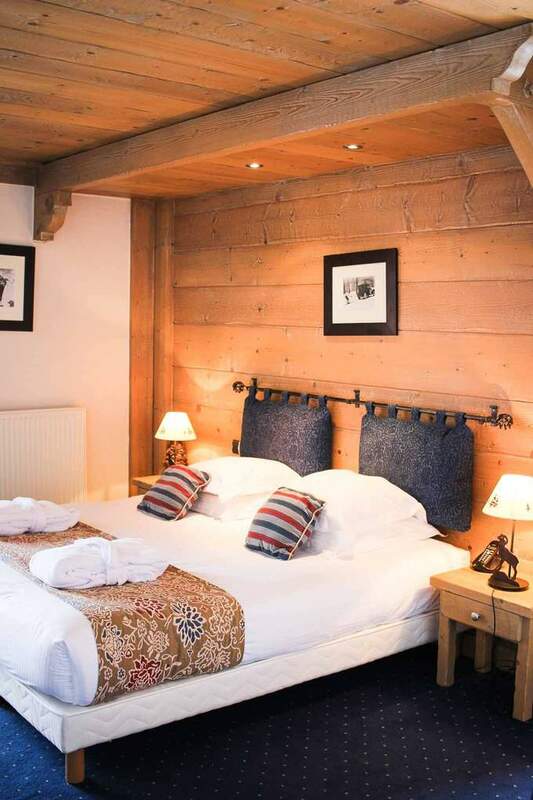 The chalet is beautifully decorated in traditional ski lodge style, but with a modern feel. Bare wood, open fires, cosy sofas, but with contemporary quality and comfort. The central lounge and bar area over looking the mountains is a great communal spot to meet other guests and relax after a day on the slopes. I also happily sat there and worked for a few hours. We’d read that Tignes was a bit, how shall we say, ugly?! We were happily surprised to find that, yes, the town isn’t chocolate box looking, but equally it’s not at all offensive. There are some 60s looking high rise buildings, but covered in snow, the buzzing little squares and outside cafe chairs, it’s really welcoming. There’s a good array of places to eat at lunchtime or on the one night of the week where the chalet kitchen is closed. Tignes is made up of smaller villages (we stayed in Tignes Val Claret and the other Mark Warner chalet is in Tignes Le Lac). There is a regular, free, easy to use, bus service between the various villages. The Chalet Hotel L’Ecrin has one large restaurant. Breakfast, afternoon tea and dinner is included each day in your stay, along with high tea for the kids in the early evening. Breakfast is a buffet style affair, complete with fresh fruit, pastries, cooked breakfast, boiled eggs, porridge and cereals. The selection was always fresh and plentiful, served in good time to make the first lift if you’re that way inclined. Afternoon tea includes fresh homemade soup, fresh breads, a couple of home baked cakes and biscuits. 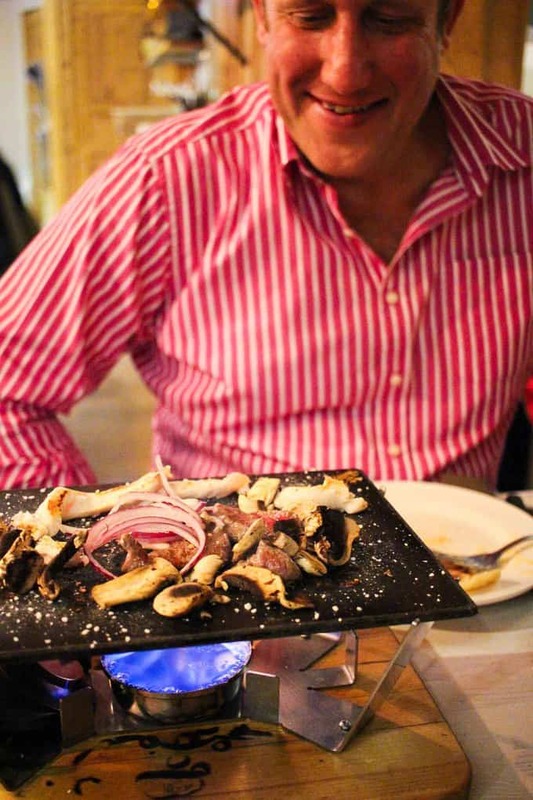 I so enjoyed this additional meal in my day (although I’m not sure that my waistline did..). High tea is served for the children, which means that they can go to watch films in the evenings whilst the grown ups have a later meal. The food served for them was a perfect balance of vaguely healthy but still appealing to little ones. Not too many breaded beige foods and chips, but just enough to keep them happy during the week of dining. Each evening in the restaurant (apart from one staff night off), an adult three course evening meal was served (although children are welcome to join if you prefer). There were three choices for each course, a good touch where often ski chalet food is one set menu. The food was excellent every evening, fresh and obviously prepared with care. We’ve stayed at a couple of Mark Warner resorts now, and other hotels with childcare arrangements. The nursery at Chalet Hotel L’Ecrin was without doubt, one of the best equipped we’ve seen. Spotlessly clean, welcoming and full of everything young children could ever fancy. It’s basically a dream of a room if you’re five. The childcare staff as always were absolutely charming. 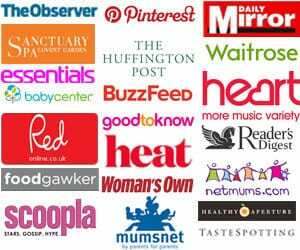 Helpful, accommodating and absolute experts in making little ones feel right at home from the moment they arrive. Big thanks to the lovely Amber pictured above, George was slightly besotted. 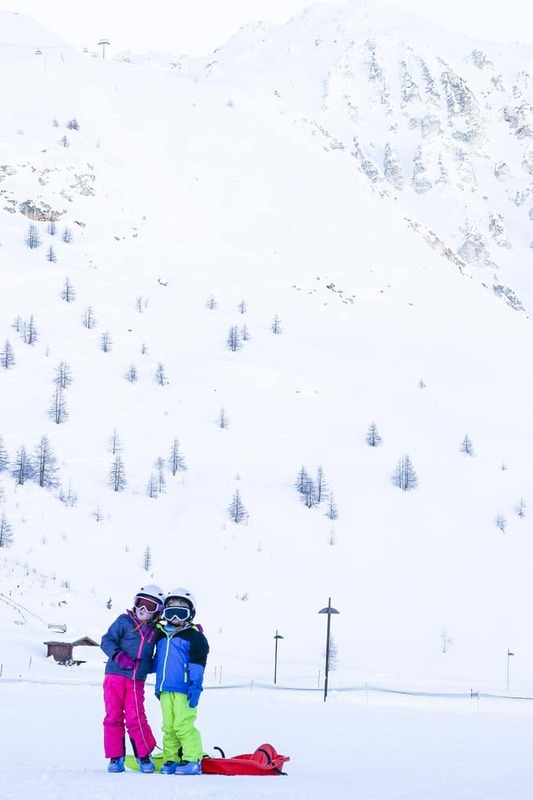 The childcare is available all day if you’d like it and if the kids are having lessons in Tignes Val Claret, the staff will take them to and from their group lesson (chauffeured by mini bus, no walking for these little skiers). In the afternoons, I often tried to collect our two early to spend some quality time together but they didn’t want to leave all the fun going on downstairs with their new pals. A shining endorsement I think. Every evening apart from the arrival day, there was a childcare option available. The children would go off to watch a movie downstairs in their PJs with the brilliant Mark Warner nannies, before snuggling down into sleep sacks. Then, after dinner, we would carry our sleepy little ones up to bed. 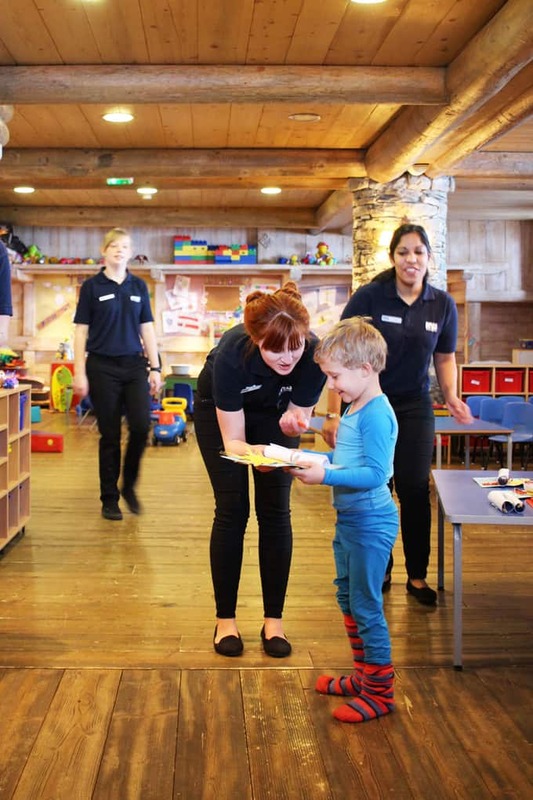 This is such a fantastic Mark Warner service, which means that the adults get to enjoy dinner whilst the kids get to have an evening adventure rather than sitting with the boring grown ups. As I mentioned in my first Mark Warner in Tignes post, I had private lessons during the week with Evolution 2. Private lessons have really helped me to get some confidence back after breaking my leg skiing years go. My lovely Evo2 instructor, Wim, ‘got me’ straight away. I explained that I just wanted to be able to come skiing each year feeling comfortable and not terrified at the prospect of getting back onto the slopes. He tailored all of my lessons with this in mind. The children had group lessons also booked through Evo2 in Tignes. Their lessons were in Tignes Val Claret and their skiing really came on during the week. However, if we visit Tignes again (and I really hope we do!) I think I would book their lessons in Tignes Le Lac (a short bus ride away). The small central square area there seems better suited for children, with everything they could need to really get confidence on a variety of beginner slopes (including under cover magic carpet lifts!). The ski area that Tignes forms part of is the Espace Killy, the biggest concentrations of world-class skiing in Europe. Walking out of the chalet, there’s a free bus to take you the three minute journey to the lifts at Tignes Val Claret or in the opposite direction (ten minutes or so) to Le Lac, from there you can ski the whole area easily. There really is skiing for all levels in the area and enough to keep even the most seasoned skier busy for a full week. There’s plenty of opportunities for guided off piste skiing too if that takes your fancy. I hope the above info and hints about Tignes and Mark Warner were useful if you’re thinking of a ski trip. We can’t recommend the Chalet Hotel L’Ecrin and family skiing with Mark Warner there highly enough! Find more info on the Mark Warner Chalet Hotel L’Ecrin. 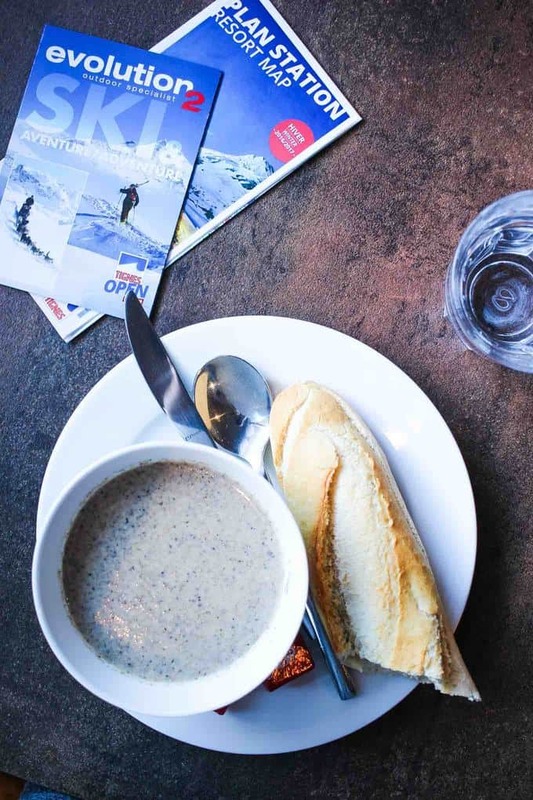 Mark Warner has 7nts at the Chalet Hotel L’Ecrin in Tignes this winter from £789pp inc flights from Gatwick or Heathrow, transfers, welcome drinks, breakfast, afternoon tea, three-course dinner with wine, evening childcare and children’s high tea. Manchester and Birmingham flights are also available. Six-day ski hire costs from £80, boots £50 and child ski hire pack from £68. Espace Killy lift passes cost €278.00 for six days, inc access to the Lagon swimming pool and loan of ice skates on any two days. Child lift passes (5 – 13 years) cost €225.50. Disclosure: With huge thanks to Mark Warner Holidays. We were invited to travel with Mark Warner free of charge in return for an honest review. « No Bake Mini Egg Cheesecake – THE Easter Recipe!